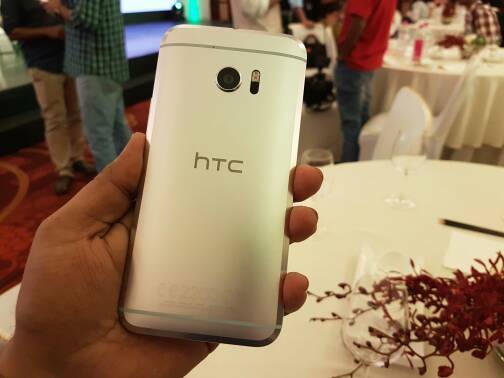 HTC 10 was launched in India today at a price of Rs. 52,990. The latest flagship from HTC comes with a 5.2 inch Quad HD display, Android 6.0.1 Marshmallow and features the Qualcomm Snapdragon 820 processor and 4 GB RAM. Other important features include a 12 MP camera on the back with laser autofocus, dual LED flash, Optical Image Stabilization and a 1.55 µm pixel size. The 5 MP front camera also comes with OIS and a pixel size of 1.34 µm for improved selfies and video calling. Answer- The HTC 10 comes in a full metal body with a lot of changes compared to previous iteration of the HTC flagship. This time, HTC has used a lot of new elements to make the design more ergonomic and logical. The front has a 2.5D curve glass that makes it look smooth from the front. The back has the major changes which include unusually wide chamfer on edges. Unlike the previous models, HTC 10 has flatter back to avoid rocking when kept on a flat surface. Even though, there is a slight curve on the sides. It feels great in hand and you can have a confortable hold to this pebble like design. Question- Does the HTC 10 Have Dual SIM Slots? Question- Does the HTC 10 Have microSD Expansion option? Question- Does the HTC 10 Have Display Glass Protection? Answer- Yes, the HTC 10 comes with Gorilla Glass 4 protection. Question- How is the Display of the HTC 10? 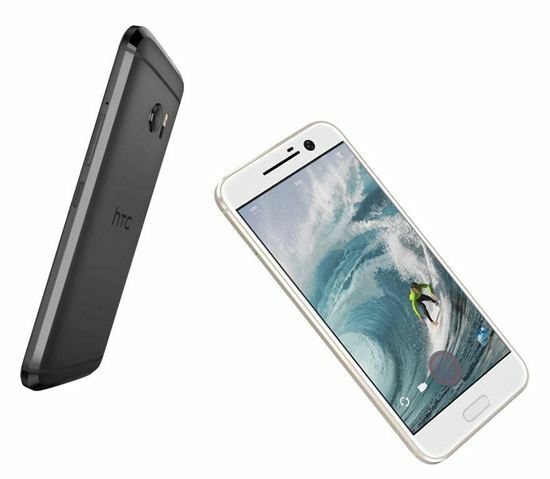 Answer- The HTC 10 comes with a 5.2 inch Quad HD Super LCD5 display. It has a pixel density of 565 ppi. Question- Does the HTC 10 Support Adaptive Brightness? Answer- It comes with the Android 6.0.1 Marshmallow with Sense 8 UI on top. Question- Is Fast Charging Supported in HTC 10? Answer- Yes, the HTC 10 comes with Qualcomm Quick Charge 3.0. Question- Can you move apps to SD card on the HTC 10? Answer- Yes, the HTC 10 comes with an LED notification light. Question- Which network bands or Operating Frequency does the HTC 10 support? Question- Does the HTC 10 offer theme options to choose from? Answer- Yes, the HTC 10 offers theme options. Question- Can we Play 4K Videos on the HTC 10? Answer- The videos will be played in Quad HD resolution (2560 x 1440 pixels). Question- What Color Variants are Available for HTC 10? Answer– Gold, Silver and Grey variants are available for purchase. Question- Can we set the display colour temperature on HTC 10? Question- Is there any in-built power saver in the HTC 10? Question- What is the Weight of HTC 10? Answer- It weighs 161 grams. Answer- Yes, it does not support tap to wake up command. Question- Does HTC 10 Have Heating Issues? Question- Can the HTC 10 be connected to a Bluetooth Headset? The HTC 10 is a really good flagship smartphone. HTC needed a great smartphone to make a comeback and the 10 features the right mixture of quality and innovation. Its design, while a little predictable, is very premium and should appeal to a large number of users. However, the company may ruin its chances with the high price of Rs. 52,990.